Detachable Laptops are designed so that you can use them both as a laptop and as a tablet, depending on what you need them for. Obviously, trying to make a piece of hardware that can function as both a laptop and a tablet isn’t the easiest thing to do. Although detachable laptops are a great idea, in practice they can be underwhelming. However, there are some excellent detachables currently available. In this guide we’ll talk you through what we think are the best detachable laptops you can buy right now. Having done careful research, we are sure that the best detachable laptop in 2018 is the Microsoft Surface Pro 4. We liked the Surface the most because it combines power, portability and a long battery life. Making it powerful enough to have at home, but light enough to use on the go too. And that’s kind of the whole point of detachable laptops. In this article we’ll talk about why we liked the Surface so much, and how the other 2 in 1s stacked up as well. Whenever we’re reviewing products, we always try to work out what users think are the most important areas for the product to excel in. That way, when it actually comes to writing our reviews, we can judge the products based on the criteria the users have given us. And write far more helpful reviews than we would if we simply talked about what we thought was important about the product. With this in mind, we’ve done some surveying on the internet, as well as using a couple of focus groups, in order to determine what users of detachable laptops think are the most important criteria to consider when buying one. We worked out this final list by taking all the detachable laptops that performed well in these categories and then checking them out ourselves. This is made up of the best performing detachables according to the above criteria. To be honest we were a little surprised this came up as the most important feature for our users. We expected something like portability or the size of the unit to be the thing users were most concerned about. But if you think about it a little bit it does make sense. I mean, the whole point of a detachable is that it can fill the role of both a laptop and a tablet. In that case it needs to be powerful enough to do whatever it is you usually do on your laptop. Plenty of the users that we asked use their laptops for work. So they are entirely reliant on their laptops having sufficient power in order to make money. Whether they use their machines to make music, or create pictures and videos, it’s absolutely essential that whatever they use is powerful enough for them to work on. Therefore, if they were going to replace their laptops with detachables then the absolute most important thing is a guarantee that they’re powerful enough that they can continue to work on them. While factors like portability and size might be nice, without the unit having sufficient power the whole point of having a detachable is defeated. It’s supposed to be able to fill two roles in one machine. If it can’t, you may as well just get a separate laptop and tablet and be done with it. Therefore, making sure that any detachable laptop has sufficient power was the most important factor cited by our users. The amount of power you need to is obviously going to vary depending on what you use your laptop for. Therefore, the lowest RAM any of the laptops we recommend is 4GB. 4GB is definitely a solid amount of RAM, and more than enough for the day-to-day browsing and word processing that makes up the majority of user’s needs. Portability (so basically the weight and size of the detachable) was also an extremely important feature for our users. While your detachable definitely needs to be powerful enough to function as a laptop. It also needs to be portable enough that you can take it around with you like a tablet. If it isn’t, then again the whole purpose of getting a detachable laptop is defeated. If you’re going to be carrying your detachable around all day, then you don’t want it to be too heavy, probably a couple of pounds at most. Similarly, you need it to be small enough to fit inside a normal bag or something of that kind of size. You don’t want to have to get out your suitcase just to take it somewhere with you. Battery life is another important consideration. Obviously if you’re using your detachable as a tablet, then you’re likely to be using it on the go. And you might not always have a charging point handy. If so, then you’re definitely going to need a detachable that has a decent amount of battery life. You don’t want to be running out of charge half way through your busy day, and be desperately running around, looking for a spare charging point and charger. With this in mind, it’s important that a detachable has a good amount of battery life in order to allow you to take it out with you without having to worry about it. Price was another important consideration for our users. With detachables, users are generally prepared to pay a little more for the convenience of essentially having two devices in one. But they don’t want to have a pay a load more. Otherwise they’ll just get two devices instead. All the devices that we recommend offer good value for money, but some are better suited to those with a ton of money to spend, and others are more budget machines. Hard Drive Space was something that our users either really cared about, or didn’t care about very much at all. For users who mostly store their work locally, hard drive space is very important. Without it they won’t have anywhere to put their work, and they’ll have to purchase external hard drives in order to have sufficient space. But for users who mostly keep their documents in the cloud, hard drive space is far less important. They can get away with having far less local storage space because they can keep it all online instead. As a result, we didn’t really know how much emphasis to place on storage space as a thing to consider when buying, because to some people it’s important and others it just isn’t. In the end we came up with a compromise. We decided that for most people having more storage space is going to be an advantage. Particularly with a detachable as you may not always be able to access the cloud when you’re away from home. So all of the models that we suggest here have at the very least decent storage space. You might not be able to storage hundreds of movies or anything like that. But there’s plenty of space for any documents you might need, even in the cheaper options we suggest. That way, if you aren’t able to access the cloud for some reason, you can still get hold of the important stuff on your hard drive no problem. Our #1 pick for this year is the Microsoft Surface Pro 4 . When trying out the Surface, I was honestly blown away by how good it was. It comes with 6th gen Intel Core i7 3.4GHz Processor, a 256GB Solid State Drive, and 16GB of RAM. For those of you who don’t know what all those fancy numbers mean… it means the Surface is astonishingly fast and powerful for a detachable. You get a 12.3” screen, which isn’t huge but does come with a massive 2736 x 1824 resolution, meaning you get lots of screen real estate to fit multiple windows, unlike a normal 12” laptop. The colors contrast fantastically and the display is crisp and bright. Having an SSD (Solid State Drive) rather than a hard drive means that the boot time is lightning quick, and the 16GB of RAM is enough power that you’ll be able to run any program you can think of with no problems at all. The Surface easily has enough power to function as your home laptop. It’s also light, weighing just a measly 1.7lbs and is thin as well, at 1.6”, making it easy to slip into a bag or just hold onto if you feel like. While the manufacturers claim a battery life of 10 and a half hours, from our testing that’s definitely a little ambitious. Still, we were able to get 8 hours of use quite comfortably. I found the battery life particularly impressive given just how powerful this laptop is. The 256GB SSD is a modest offering and the Surface also comes with a MicroSD slot which can hold a 128GB card if you need more. While I thought the Surface was brilliant, it’s not perfect. Obviously when coming up with a detachable laptop you’re going to have to make compromises. One of the most obvious of these is a lack of CD drive, which some users might find annoying. We loved using the Surface in its tablet form, the included stylus (yay) is accurate and easy to use. Additionally, taking notes or drawing is also fun and interactive. The Pro 4 is a little on the expensive side. I would definitely argue that its power and portability justify the price, but I can understand why some might find it a touch too pricey for their taste. Overall though, we were all massively impressed with the Surface, and definitely consider it to be the king of the detachables. The XPS 12 is another excellent option, but lacks a bit of power and multitasking capability compared to the Surface. It comes with an Intel Core M 6Y54 1.1GHz processor, 8GB of RAM and 256GB of SSD storage space for snappy performance. One of the big advantages of an M processor is that they’re fanless, meaning the XPS is very quiet. These are very decent specs, it offers easily enough storage space to keep important documents stored locally, and enough speed that you’ll be able to run office programs without any issues at all. 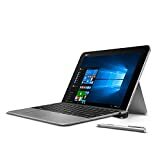 It’s also extremely portable, at just 2.8lbs, and its 12.5 inch screen makes around the same size as the Surface, meaning you can carry about with little difficulty. The battery life was a little disappointing compared to the surface, and we only managed to get about 4-4.5 hours out of the XPS. Part of the reason for the average battery life is the amazing resolution of the 12.5” display. You get a whopping 3840 x 2160 pixels (4K Quality), which provides you with incredible colors and on screen space. Unfortunately, a stylus isn’t included with the XPS. I believe all detachables should come with a stylus included, but apparently Dell doesn’t share the same logic! Be sure to grab one at checkout. While it lacks the power of the Surface Pro, the XPS has excellent portability, and at the same time has more than enough power for most tasks too. The Miix 700 offers 8GB of RAM which is paired with an Intel Core M5-6Y54 1.1GHz processor. Like the XPS, the M series of processors are fanless meaning this laptop operates very quietly. Standard for this price range, you get a 256GB SSD which is a necessity to make the laptop snappy and responsive, with quick boot up speeds. It’s the heaviest of the bunch, weighing in at 5lbs and 3.1 inches thick. It’s still more than light enough to carry around with you if you so choose. The battery life is quite good, we were able to get around 9 hours by doing some basic web surfing and word processing and this ensures you have plenty of time to get to a charger before the laptop runs out of juice. As is common with detachables, the Miix has a 12” Full HD screen with a solid 2160 x 1440 resolution. It doesn’t have as many pixels as the Surface and XPS, but that by no means indicates that the screen is bad. Again, a stylus isn’t included with the product so be sure to include one if you prefer a stylus to your finger. We got a stylus and found the Miix to actually have one of the more responsive and accurate screens out of the lot. Overall, this is a good midrange choice with solid specs, but comes with it’s downsides such as not coming with a pen and no backlit keyboard. The Spectre has solid specs for the price range. An Intel Core M7-6Y75 1.2GHz processor, paired with 8GB of RAM allows a level of multi-tasking that you don’t get with the budget variants. As mentioned before the M range processors are fanless meaning quiet operation. You’ll get a 128GB SSD, which is fairly standard for this price range, but we were hoping for more. Although, if you do compare it to the Surface Pro in this price range you’d only get 128GB too. The key drawcard for this laptop I believe is the 12” Full HD screen that comes with an IPS panel, meaning the color reproduction and viewing angles are increased (useful if looking at the laptop from side on etc.). It’s got a 1920×1080 resolution which will give you lots of screen space. The Spectre is very light, only 2.68lbs together and 1.84lbs as the tablet itself. It’s also only 0.52 inches thick with the tablet and base which makes it the thinnest laptop on this list. If portability is what you’re after then you have to consider the X2. You’ll get up to 10 hours of battery life. In our tests that proved to be accurate, although if you planned on multi-tasking for hours then you’d be looking at a touch less. You’ll need to buy a stylus separately unfortunately, but if you’ve read from the top, you’ll know that’s becoming a regular occurrence for manufacturers. The ASUS is the smallest and lightest detachable laptop we’ve looked at so far, weighing in at 1.68lbs and with a screen size of 10.1 inches. This makes it incredibly portable, and very easy to just stick in a bag and forget about. If this is the main thing you’re looking for in your detachable, then you might really like the T102. The long battery life also adds to its all-round portability. The ASUS is rated for 11 hours of video playback and although we didn’t quite get that, we had 10 and a half hours constant play no problem, which is really excellent. It has 4GB of RAM and 128GB of storage space, but only a 1.4GHz processor. We found it adequate for word processing, surfing the web and even using general apps like the Microsoft Office suite etc. I wouldn’t try and game on it though! As is the trend with detachables, the 10.1” screen still boasts a 1280 x 800 resolution, which will make the screen feel bigger than it is. Other cool features such as a fingerprint reader, hinge design to open the laptop up to 170 degrees make this an all-round solid choice. Additionally, it also comes with a stylus (finally) so you don’t need to add any extra costs into the equation. This is a great mini detachable and if you’re after something extremely portable that you can use for things like word processing and internet browsing at home and on the go, then the T102 might be just up your alley. Of all the detachable laptops we looked at, our favorite was definitely the Microsoft Surface Pro 4. Its incredible powerful, offers huge storage space, a long battery life and is extremely portable despite all its impressive features. Although it’s not cheap, we all felt that the Surfaces’ phenomenal features meant it offered value for money. Having said that, all the detachable laptops we looked at here are excellent in their own ways. You just need to be sure what you’re looking for before you make a purchase. The Best Detachable Laptops can be used effectively in both laptop and tablet format. Also known as 2-in-1s, these laptops are highly versatile!